This month, Audible Studios released the audio version of CADDYSHACK: THE MAKING OF A HOLLYWOOD CINDERELLA STORY, in which Entertainment Weekly film critic Chris Nashawaty goes behind the scenes of the iconic film, chronicling the rise of comedy’s greatest deranged minds as they form The National Lampoon, turn the entertainment industry on its head, and ultimately blow up both a golf course and popular culture as we know it. The Audible book, which released simultaneously with the print version, is narrated by Peter Berkrot, who also played Angie D'Annunzio in the original CADDYSHACK. The book goes into how the gopher ended up in the film, spends some time on the infighting, the drug abuse, and other salacious elements surrounding the production, but the book is at its core a deeply human story about the life and early demise of National Lampoon co-founder Doug Kenney. While at Harvard University, Kenney was the manager of The Harvard Lampoon. There, he was a part of a group of newcomers who restyled the school humor magazine. Another of these scholars was Henry Beard, with whom Kenney forged a lifelong personal and professional relationship. Together with Beard, he composed the short novel BORED OF THE RINGS, which was originally distributed in 1969 and has since been translated into over a dozen languages. Kenney graduated in 1968. Before long, he, Beard and fellow Harvard graduate Robert Hoffman started to take a shot at establishing the National Lampoon magazine. Kenney composed a significant portion of the Lampoon's initial material and left an indelible mark on the publication for its entire run. Kenney was known to take unannounced expanded breaks and go completely off the grid for months at a time. During one of these breaks, he wrote "High school Commies from Outer Space". A novel that Kenney tossed in a garbage can after Beard gave the manuscript some negative feedback. Keeny was also responsible for National Lampoon's 1964 High School Yearbook, which went on to become one of the magazines most successful publications. Kenney had a five-year buyout contract with the Lampoon's distributor, 21st Century Communications. Kenney, Beard, and Hoffman took full advantage of it. When it was all said and done they divided $7,000,000. Kenney stayed on staff until 1977, when he exited the magazine to develop the screenplay for National Lampoon's ANIMAL HOUSE, alongside Chris Miller and Harold Ramis. A film that went on to break numerous box-office records and is considered to be a classic amongst many comedy fans. Nashawaty's book starts with a confrontation in Dangerfield's comedy club around the press junket for CADDYSHACK. After that, the story circles back to Kenney's time at Harvard and slowly builds to the skirmish introduced in the first chapter. A film that has been quoted by presidents, spawned a (best forgotten) sequel and inspired a theme restaurant, was in no way a box-office or cultural failure but was ultimately the artistic endeavor that pushed Kenney off a remote Hawiaan cliff. 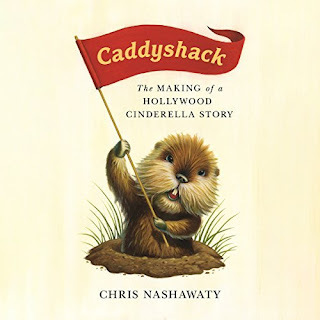 CADDYSHACK: THE MAKING OF A HOLLYWOOD CINDERELLA STORY can be purchased on Audible HERE.